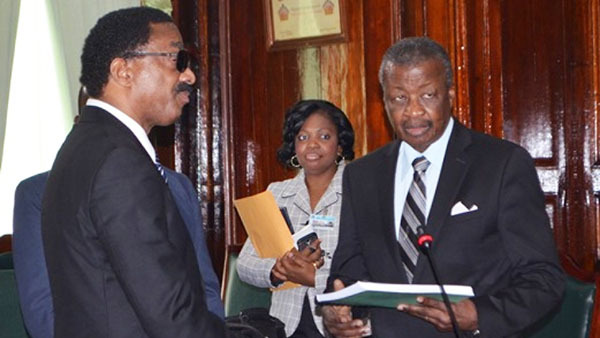 Attorney General and Minister of Legal Affairs, Basil Williams, left, hands over a copy of the COI report to Speaker of the National Assembly, Dr. Barton Scotland. Photo credit: GINA. GEORGETOWN, Guyana, May 11, (CMC) – The Guyana government has handed over a copy of the Commission of Inquiry into the death of noted historian and political activist, Dr. Walter Rodney, even as the main opposition People’s Progressive Party (PPP) was moving to bring a motion on the issue to Parliament on Thursday. Attorney General, Basil Williams, handed over the document to Speaker Dr. Barton Scotland so that it will be laid in the National Assembly. In February, the government said that presentation of the report was delayed because the ink being used to print the document had finished. The Ministry of the Presidency in a brief statement said “Commissioner of the Walter Rodney Commission of Inquiry, Sir Richard Cheltenham, did not submit the COI Report to President David Granger, as was scheduled. “Sir Cheltenham reported that he was unable to make the scheduled time because he had run out of ink to print the document,” it added. 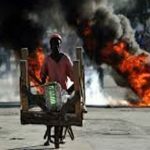 The previous government had set up the Commission in February 2014, to inquire into what led to, and who was responsible for, the bomb blast that killed Rodney on June 13, 1980. It was chaired by the Barbadian jurist with the authorities indicating that it had cost the state GUY$400 million (One Guyana dollar =US$0.004 cents) to complete. Williams told reporters, after handing over the report, that there was no delay in presenting the report. He explained that a process had to be undertaken which involved a review by the President, the Cabinet and other interested parties. A copy had already been handed over to the widow of Dr. Rodney. But Williams told reporters he believed that the report is flawed. 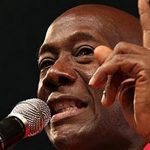 He said there was “no real pursuit of justice” while noting that the People’s National Congress (PNC), which was in power when Rodney was killed, will host a news conference soon where it will respond to the report. President David Granger has also dismissed the report as being deeply flawed, noting that the Commission had depended largely on hearsay evidence in their determination that the Forbes Burnham-led PNC government was responsible for Rodney’s death.